Inside Newport Harbor, on the grounds of the Hyatt Regency Hotel. With their permission, you can go right on the grounds and view the lighthouse up close. They are very accommodating if you respectfully ask them. Newport was part of the infamous Triangle Trade where African slaves were traded in the West Indies for sugar and molasses, which was used for rum in Newport. 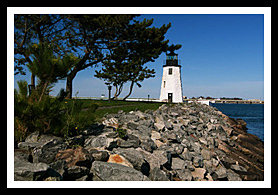 Newport Harbor Lighthouse was the first lighthouse built in the Newport area on Goat Island in 1823. It was built to mark a treacherous rocky shoal that extended out from the island. Even with the light established, ships rounding the northern part of Goat Island at night or in stormy weather would sometimes run aground on the shoal. 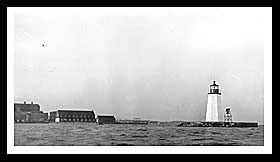 The Navy purchased the island and Fort Wolcott in 1869. In 1906, the Navy Torpedo Factory was built on the island employing thousands. The first self-propelled torpedo was developed, and during World War II, 80% of the torpedoes used in the war were produced at Goat Island. In 1921, a submarine hit the breakwater, damaging the keeper's dwelling which had to be torn down. Newport is Rhode Island’s gateway for tourists with concerts and events. Newport plays host to a number of festivals during the summer months, including the Newport Jazz Festival, Newport special waterfront events like the great Chowder Cook Off, the Newport Folk Festival, the Newport International Film Festival, and the Newport International Boat Show. Visit the Museum of Newport History to learn about Newport’s rich history and architectural beauty in its many mansions. The Breakers Mansion, also reffered to as the Vanderbuilt Mansion. Tourists from all over the world come to visit its many attractions including it’s most elaborate mansions with tours of the rich and famous that shaped America’s 19th and 20th centuries. 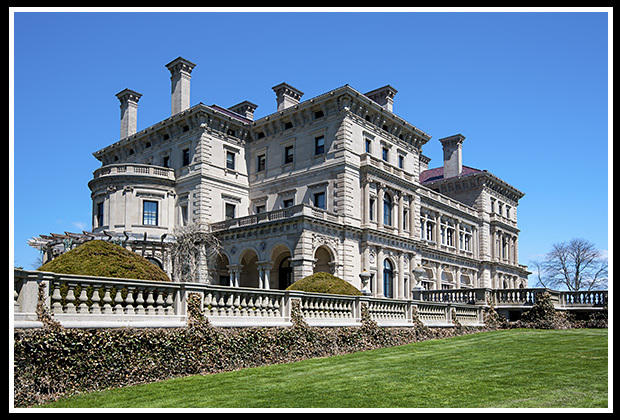 They include the Marble House, the Breakers, the Hunter House, Elms, Rosecliff, the Chateau-sur-Mer, Chepstow, the Kingscote, the Isaac Bell House, and Belcourt Castle which offers another unique opportunity to step back in time and enjoy the atmosphere of the Gilded Age. The Cliff Walk is 3.5 miles along an elevated path, where you'll get the chance to see the many mansions that define Newport along with picturesque views of the harbor. It begins at First Beach, or Easton's Beach, and finishes at the private Bailey's Beach. Other walks in Newport include the Newport Harbor Walk and the Ten Mile Ocean Drive with many of those miles you have public access to the shoreline, starting at the Breakers mansion. To get views from land, in Newport take Highway 238 to its southern end and then go west to reach the bridge to Goat Island. You will see the lighthouse to your right as you approach the island. To get closer, from Route 114 South in Newport, turn right at Admiral Kalbfus Rd. Then turn left at Third St. Turn right at Sycamore St (one way). Then turn left at Washington St, and then right at the Goat Island Connector. Park at the Hyatt Regency Hotel. You can reach the grounds of the lighthouse by quietly passing through the lobby of the Hyatt Regency Hotel. The people there are very nice as long as observers respect their patron’s privacy. In addition to a stop over at Rose Island lighthouse they offer special 2-hour narrated lighthouse tours on Saturdays and Sundays during the summer months, departing from Jamestown, RI. Lighthouses: Newport Harbor (Goat Island), Lime Rock, Castle Hill, and Rose Island. Newport Harbor excursions aboard a newly restored Elco Motor Yacht, built during prohibition in 1929, or go sailing on the 72-foot Schooner Madeleine. Both offer views by the Newport lighthouses. 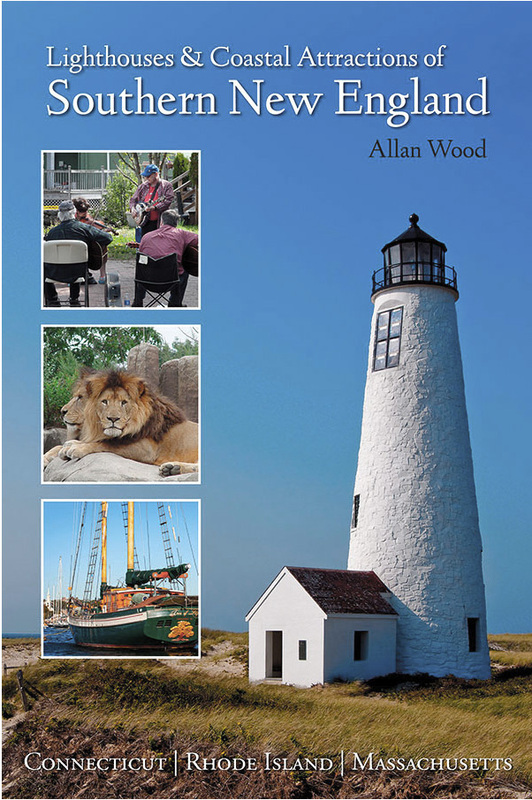 Organization for lighthouse and coastal preservation provides Ultimate Lighthouse Tour, Northern Bay Lighthouse Tour, Southern Bay Lighthouse Tour, and Providence Sunset Lighthouse Cruise. Include stopovers to tour inside lighthouse.